If you've been reading my blog for a little while, you know that I am passionate about truck driving. I love being a truck driver, and certainly plan on doing this for a while. I've also found that as my experience grows, my enjoyment also continues to grow. I'm still considered a rookie with only 8 months experience, but the little experience I have is already paying off. Probably the biggest issue I have in truck driving is finding a place to park at night. I enjoy driving at night as I've always been a bit of a night owl. But this poses a huge problem. Just finding a parking spot to grab a shower or get a mealcan be a chore, and if I want to shut the truck down and get some sleep anytime after 8pm, I have to start looking for a place to park at least an hour in advance, sometimes more. Even if there is a parking space available at that time of night, I might not feel comfortable safely backing into the tight spot. This takes a ton of enjoyment out of my driving if it's late at night. However, I'm beginning to learn. I know, for example, that I will not be able to find a spot at night in Effingham, IL (an area with several truck stops). But if I'm passing through Gary, IN, I know that parking is fairly easy to come by. If I'm near Atlanta, GA., I know the Petro is the best place to stoplate at night.This has allowed me to plan my trips out better. Knowing where parking is tight and where it is abundant has brought a ton of my enjoyment back. I'll plan out ahead of time where I will stop to look for parking. Lately, I've been getting it right. The more truck stops I visit and the more experience I get being in certain parts of the country, the more I learn what I can and can't get away with. I also had a real bad habit of getting lost when I first started. I'd get within 10 miles of my customer, get turned around in a city, and have to find uncomfortable places to make a U-Turn. This is starting to ease as well. I still get lost from time to time, but I've visited the majority of our larger customers, at least in the Midwest and plains. So when I get a load assignment and see the customer locations, I usually say "oh yeah, I remember that place!" I'm beginning to learn the best routes to take to get to specific customers, which customers allow overnight parking, which customers load quickly or slowly, which ones have driver facilities, where the truck stops are located near those customers, etc. This is just another aspect of driving that is becoming more "routine" for me, and much less stressful. Navigating large cities has become a breeze. Aside from things I can't control such as traffic and construction, going through a large city is becoming more and more simplified. Going through Atlanta? No problem. Dallas? I know exactly where to go. New York City? Well, that's just never fun! It seems like everyday I'm still learning or refining my skills driving the truck. It's kind of fun to watch myself improve. Customer's docksthat were very difficult to back into a few months ago are relatively easy for me now. Backing in off a congested street is just another day, where before it was an extremely stressful situation. I'm beginning to enjoy the challenge of a hard spot to back into. Just the other day I had to drop a trailer in a very unfriendly drop lot. There was one space available, and it was tight. I slid the tandems all the way back (makes it easier to back in), took a deep breath, and started to ease it in. I had to get out and look a couple times and came within inches of the trailer on the left of me (intentionally), but I got it in there. I'd like to say I played it off, but I did crack a bit of a smile after I set the brakes and was ready to disconnect the trailer. It was a backing situation that I could have never accomplished just a couple months ago. My psychic skills have improved too. When driving down the road, I seem to know exactly what each car around me is going to do at any specific time. I know when I'll be cut off, so I leave more space in anticipation. I know when a car will squeeze between me and a truck that just passed and is waiting to move back over to the right lane. 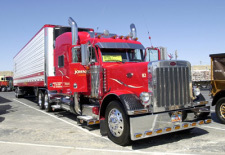 When I first started driving, another TruckingTruth blogger, Rhonda, frequently said truck drivers have to drive not only their truck, but all the cars around them too. I now understand exactly what she means. If I anticipate a car will do something, every now and then I'll have to position myself to block what they were planning on doing. Other times, I'll leave more space to make their idiotic move safer for me and everyone around me. Driving through congested areas is a lot like playing chess. Sometimes you have to plan 3 or 4 moves ahead. Getting the weight right on my truck has become nothing but a routine inconvenience. After being loaded, I slide my tandems to where I think the weight on each axle will be legal. Upon weighing my load, I'll be spot on. I don't think I've been wrong on my weight oncefor a good 4 to 6 weeks now, so no more stressing about weight. Truck driving can still be a stressful ordeal at times. But I'm finding that my life was much more stressful when I had my office job. And as my experience grows, the stress on the road is easing even more. With only 8 months experience, I believe that the stress level will continue to decrease, and my enjoyment will continue to increase. I really believe that truck driving would be a great career for just about anyone, if it weren't for one thing - solitude. There are guys like me who thrive in solitude, but then again, I don't think I am the norm here. Others who have wives, kids, and loved ones back home, or just need company all the time, simplycan't make it on the road. But if you're single and can stand being alone for weeks at a time, this is probably one of the most stress-free and enjoyable jobs you could ever have. Yes, it is stressful at first. Getting that CDL and going through company training then the transition into being a solo driver is one of the most stressful things you will ever go through in life. Andtoo many peoplequit before they are given the chance to really enjoy this lifestyle.But if you can make it through that, get some experience under your tires, and try to learn something everyday, the fairly stress-free living is a great feeling. I've never been so stress free in my life. I chalk that up to my growing experience, and thriving in this lifestyle. Now if you'll excuse me, I've have some classic rock to blast as I cruise the open road and take in the sights. And yes, I get paid for this!